California encephalitis (CE) is a relatively common, reportable, childhood central nervous system (CNS) disease transmitted by mosquito bite. It is second in importance to West Nile viral encephalitis among the mosquito-borne viral diseases in the United States, with about 80-100 cases reported yearly. See the image below. 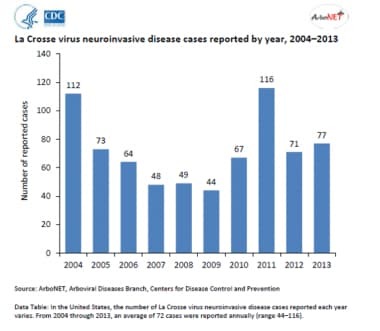 Range of California encephalitis cases reported in the United states from 2004-2013. Courtesy of CDC and ArboNET. Most infections are asymptomatic, and the majority of infected individuals who develop symptoms recover completely; however, up to 10% of patients develop behavioral problems or recurrent seizures. Severe disease often manifests as encephalitis (inflammation of the brain) and can cause seizures, coma, and paralysis. Mortality rates are low (< 1%). The condition was named California encephalitis after the first human case (caused by a virus called California virus) was described in Kern County, California, in 1946. Since then, most cases have been associated with La Crosse (LAC) virus. La Crosse virus was first isolated from the brain of a 4-year-old boy who died of encephalitis in La Crosse County, Wisconsin. California encephalitis (CE) is caused by a group of viruses that belong to the genus Bunyavirus and the family Bunyaviridae. This largest family of RNA viruses has more than 350 named isolates with worldwide distribution. Bunyaviruses are spherical, lipid membrane–enclosed viruses that are 90-110 nm in diameter. They contain 3 negative-sense RNA segments and an enveloped nucleocapsid. The nucleocapsid protein is believed to be immunogenic. Most cases of California encephalitis are caused by La Crosse virus, although a number of other antigenically related viruses make up the California encephalitis group, including California and Jamestown Canyon viruses. Alternating cycles of infection occur between the mosquito and the vertebrate hosts, including humans. The mosquitoes obtain the virus after a blood meal from hosts who are in the viremia stage. The transmission cycle for La Crosse virus is demonstrated in the diagram below. La Crosse virus transmission cycle. The virus is maintained by vertical transmission in Aedes triseriatus mosquitoes; the virus winters in infected eggs that are usually deposited in tree holes or in artificial containers holding rainwater. 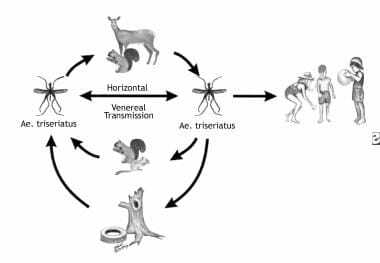 Horizontal transmission (by viral amplification in small vertebrates, eg, squirrels and chipmunks, and venereally among adult mosquitoes) is required to supplement vertical transmission. The role of deer in viral amplification is uncertain. Human infections are incidental to the transmission cycle. After inoculation via a mosquito bite (usually the female mosquito), the virus undergoes a local replication at the original skin site. A primary viremia occurs, with seeding of the reticuloendothelial system, mainly the liver, spleen, and lymph nodes. With continued virus replication, a secondary viremia occurs, with seeding of the CNS. The probability of CNS infection depends on the efficiency of viral replication at the extraneural sites and the degree of viremia. The virus invades the CNS through either the cerebral capillary endothelial cells or the choroid plexus. Rarely, the virus is isolated from brain tissue. Antibodies against the G1 part of the virus neutralize the virus, block fusion, and inhibit hemagglutination. They are also important in virus clearance and recovery and in prevention of reinfection. Several epidemiologic factors influence arboviral encephalitis, including (1) the season, (2) the geographic location, (3) the regional climate conditions (eg, spring rainfall), and (4) patient age. The highest incidence of arboviral encephalitis in the United States is in the midwestern states. Most cases occur in the late summer to early fall, although, in subtropical endemic areas (eg, the Gulf States), some cases occur in winter. Outdoor activities, especially in woodland areas, are associated with an increased risk of infection. Historically, La Crosse encephalitis has been reported in 28 states, mostly from the northern Midwestern states (Minnesota, Wisconsin, Iowa, Illinois, Indiana, and Ohio). Recently, more cases have been reported from mid-Atlantic and southeastern states (West Virginia, Virginia, Kentucky, North Carolina, and Tennessee). See the image below. 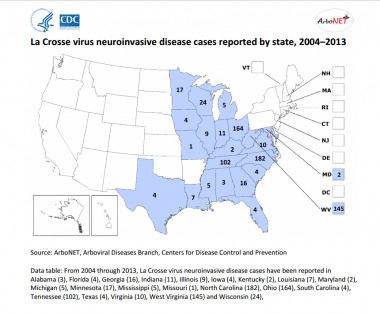 La Crosse virus neuroinvasive disease cases reported by state, 2004-2013. Courtesy of CDC and ArboNET. In areas where the disease is endemic, the incidence exceeds that of bacterial meningitis before the introduction of the Haemophilus influenzae vaccine. La Crosse encephalitis may be underrecognized, not only in terms its prevalence but also in terms of severity. California encephalitis is more common in males than in females, probably because of more outdoor exposure. Clinical disease occurs almost exclusively in children aged 6 months to 16 years (peak, 4-10 y). The older the patient, the less likely he or she is to develop the clinical illness. For patient education information, see the Brain and Nervous System Center, as well as Encephalitis. HAMMON WM, REEVES WC. California encephalitis virus, a newly described agent. Calif Med. 1952 Nov. 77 (5):303-9. [Medline]. Watts DM, Thompson WH, Yuill TM, DeFoliart GR, Hanson RP. Overwintering of La Crosse virus in Aedes triseriatus. Am J Trop Med Hyg. 1974 Jul. 23 (4):694-700. [Medline]. McJunkin JE, de los Reyes EC, Irazuzta JE, Caceres MJ, Khan RR, Minnich LL, et al. La Crosse encephalitis in children. N Engl J Med. 2001 Mar 15. 344 (11):801-7. [Medline]. Sokol DK, Kleiman MB, Garg BP. LaCrosse viral encephalitis mimics herpes simplex viral encephalitis. Pediatr Neurol. 2001 Nov. 25(5):413-5. [Medline]. Wurtz R, Paleologos N. La Crosse encephalitis presenting like herpes simplex encephalitis in an immunocompromised adult. Clin Infect Dis. 2000 Oct. 31(4):1113-4. [Medline]. Hubalek Z, Sebesta O, Pesko J, Betasova L, Blazejova H, Venclikova K, et al. Isolation of Tahyna Virus (California Encephalitis Group) From Anopheles hyrcanus (Diptera, Culicidae), a Mosquito Species New to, and Expanding in, Central Europe. J Med Entomol. 2014 Nov 1. 51 (6):1264-7. [Medline]. Jones TF, Erwin PC, Craig AS, Baker P, Touhey KE, Patterson LE, et al. Serological survey and active surveillance for La Crosse virus infections among children in Tennessee. Clin Infect Dis. 2000 Nov. 31 (5):1284-7. [Medline]. de los Reyes EC, McJunkin JE, Glauser TA, Tomsho M, O'Neal J. Periodic lateralized epileptiform discharges in La Crosse encephalitis, a worrisome subgroup: clinical presentation, electroencephalogram (EEG) patterns, and long-term neurologic outcome. J Child Neurol. 2008 Feb. 23(2):167-72. [Medline]. McJunkin JE, Khan R, de los Reyes EC, Parsons DL, Minnich LL, Ashley RG, et al. Treatment of severe La Crosse encephalitis with intravenous ribavirin following diagnosis by brain biopsy. Pediatrics. 1997 Feb. 99 (2):261-7. [Medline]. Conti B, Benelli G, Leonardi M, Afifi FU, Cervelli C, Profeti R, et al. Repellent effect of Salvia dorisiana, S. longifolia, and S. sclarea (Lamiaceae) essential oils against the mosquito Aedes albopictus Skuse (Diptera: Culicidae). Parasitol Res. 2012 Jul. 111(1):291-9. [Medline]. Brain biopsy specimen from a 7-year-old boy with severe La Crosse encephalitis (hematoxylin and eosin stain, 200X). Perivascular infiltration with mononuclear cells is present on light microscopy. This biopsy material tested positively for La Crosse virus antigen on direct immunofluorescence assay. Left image of a CT scan of an 8-year-old boy with severe La Crosse encephalitis complicated by uncal herniation (obtained on the second hospital day) reveals brain edema with associated obliteration of perimesencephalic cisterns (arrows). On the right, a T2-weighted magnetic resonance image obtained from a 7-year-old boy with severe La Crosse encephalitis shows focal areas of increased signal intensity in the right temporoparietal and left frontotemporal regions (arrows). The authors and editors gratefully acknowledge the contributions of previous authors Eleftherios Mylonakis, MD, and Eduardo Gotuzzo, MD, to the development and writing of the source article.